I’m Rob Nesbitt A.K.A. ‘Nezzy’ and have been learning how to draw a cartoon ever since I was big enough to lift up a pencil. I am a published cartoonist and have created thousands of cartoons and designs for wall murals, coaches, leaflets, web sites, tee shirts and just about anything else you can think of that a cartoon can appear on. I live with wife Joanna, who does all the boring stuff (admin and bills! ), two kids, two cats and a pen to draw with! 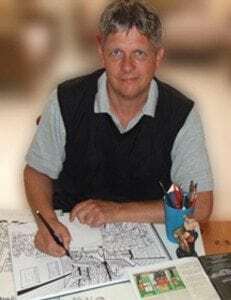 I used to be in the fire service but retired in 2008 after 30 years of squirting water about and now run a fire safety business and draw cartoons. ProCartoon.com is for professional cartoonists and graphic designers who are currently in the digital age or are looking to use graphics drawing tablets to add a new dimension to their artwork. Technology changes so fast that it is sometimes difficult to keep up with the constant stream of upgrades and innovations. I strive to give you the best articles and reviews on graphics drawing tablets and pads that I possibly can so that you can have a more informed choice of what it out there on the market. 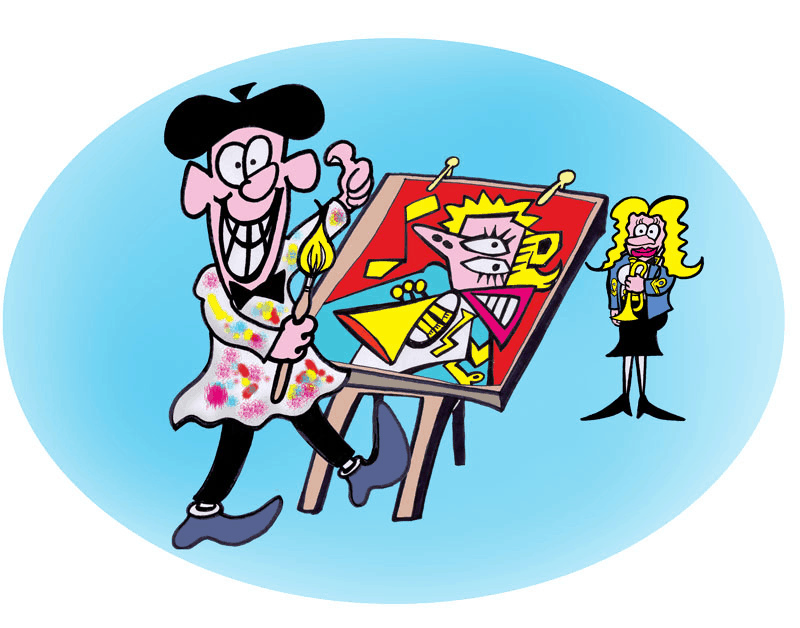 I also look at other art equipment related to the cartoonist and graphic artists toolkit and constantly add articles and reviews with the site being generally updated on a weekly basis. Last but not least I hope you enjoy ProCartoon.com – Thanks Rob. Images and written content on Procartoon.com may not be reproduced or transmitted in any format without written permission of the site owner. All artwork and other images produced by ‘Nezzy’ is copyright to Rob Nesbitt and may not be copied, reproduced or displayed without prior consent. Unsolicited articles e.g. guest posts are welcome for publication on this site (subject to approval), but the owners accept no responsibility for return of submission material. Opinions expressed on procartoon.com are not necessarily those of the site owners or contributors. The site accepts no responsibility for claims by advertisers or statements made by individuals or traders. We are committed to protecting your privacy. We will not pass on any individuals details for third party use without your prior consent. Subscribers to Procartoons mailing list will receive occasional newsletters. If you decide you no longer wish to receive e-mails you can unsubscribe. We do not retain your details when you unsubscribed. Robert Nesbitt (owner of procartoon.com) is a participant in the Amazon Services LLC Associates Program, an affiliate advertising program designed to provide a means for sites to earn advertising fees by advertising and linking to amazon.com. In addition, procartoon.com has other affiliate links. Clicking on these means we get a nominal commission when a product is purchased. This does not affect our reviews, which are objective and have no bias based on affiliate fees. Links to other sites are included on this site. Privacy policies on other websites via links from procartoon.com may differ to ours. Products listed on the site are generally linked to sites where Procartoon.com is an affiliate. This means that if you purchase an item from another site via a link we may receive a small affiliate fee. When making a purchase from another web site their policies, terms and conditions will apply. Procartoons.com utilizes log files providing information such as internet protocol (IP) addresses, Internet Service Provider (ISP), and gather demographic information all of which are not personally identifiable. Google’s use of the DART cookie enables it to serve ads to procartoon.com visitors based upon their visit and other sites on the Internet. Any changes we make to terms and conditions are displayed in this section. When you subscribe to receive the Procartoon.com newsletter, you are registering on the basis that we may send you occasional informational and promotional newsletters via email. Occasional means just that – once or twice a month as we appreciate how annoying constant e mails can be.